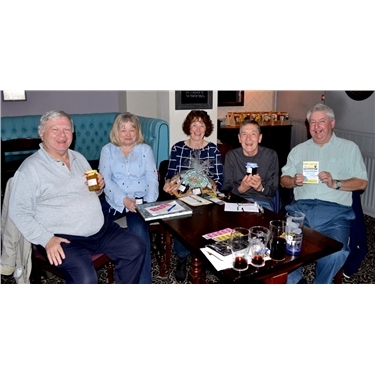 First-timers team ‘Part of the Pride’ won the first Cats Protection pub quiz of the year which raised the super sum of £370. And this time the monies will go to Walsall Road Allotment cats vet fund. The allotments, in Perry Barr, is where seven feral and semi-feral felines live happily - although just now no-one is sure if that will be ‘happily ever after’. This is because there are plans afoot to redevelop the area to make more room for the Commonwealth Games in 2022. But dozens signed a hard copy of the petition on quiz night; see the link to add more support to save the allotments. Now back to the quiz! The team judged to have the best name was 'Cats with Attitude'. Certainly they have the right 'attitude' as they've supported Cats Protection for several years. Hosts with the most on the evening were the management and staff of the Digby who donated raffle prizes of a meal-for-two voucher - won by Carol of Cats with Attitude! - and a bottle of wine. Quiz compere Adam kept the evening running smoothly and on time and North Birmingham branch volunteers Nicole & Rich, Amanda, Jenny, Sue, Kathy and Lee did all the organising, scoring, fetching and carrying. Volunteer Mary penned the questions and Richard Brown managed to take part in the quiz and break-off to take photographs. Multi-tasking volunteer Sue Morgan says ‘everyone planned well-ahead for the event, held on Monday, 25thFebruary’. Dates for future quizzes – all Mondays – 20 May, 19 August, and 25 November.